HiBid connects you to real auctions from real auctioneers in the United States, Canada, and around the world. 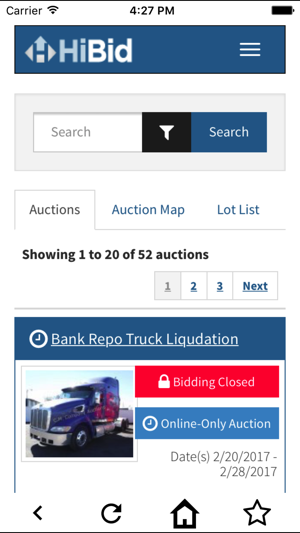 Stay connected to thousands of live and online auctions. I’ve lost many auctions as well as bid on the wrong items when swiping to bid. I thought I’d won a painting I bid on and when I went to pick it up it turns out I bid $60 on a random 3.5 inch carving of a moose. I was really confused but the items switch before the picture and the description does. I’ve given it many chances... I’ll still keep the app because of the pop up notifications however I always log into HiBids using safari which has yet to fail me. The app however is train wreck hoping for an update that’ll fix it. As others have experienced, all sorts of errors when trying to do basic navigation. Also, the app does not actually take advantage of any "mobile app" UX fundamentals. If basically creates a viewport into a mobile compatible view of the website. There is opportunity to do something nice here and create a real mobile app. Recommend removing the app from the marketplace until it can be invested in. Consider outsourcing the CX, UX, and development to a team/company with the right experience. Always get an error message!! Every time I try to use this app at some point I get an error message about that says Failure. The message tells me to check my internet connection although all my other apps work just fine. This would be a great app it they would fix their problems! !